We've been pretty lucky this winter so far; even during periods of cold temperatures, we have had pretty good snow cover. I like to feel as though Ma Nature has tucked in my plants with a layer of white, fluffy insulation to help keep them cozy in the ground. The other nice thing about the snow is that it reveals things that you may not otherwise know or see. 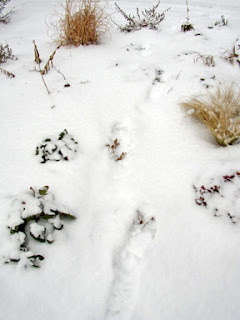 For example, these footprints lead directly from my mailbox to the neighbor's, right through my garden!!! Now, I know that the snow is hiding a lot of my plants, and that others have died back to the ground entirely, but still... only someone who wants to pretend that they aren't walking through a garden could mistake this area for a lawn. And since I do not have a new mailperson, she knows what this looks like during the rest of the year. Grr. 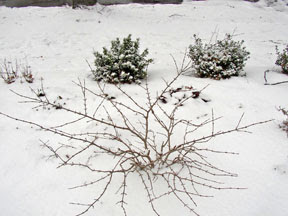 Snow also reveals the "bones" of the garden, including the branching structure of some shrubs that are otherwise hidden beneath a leafy canopy. This is my doublefile viburnum, and between its horizontal branching habit, the beautiful, leathery green of its leaves, and the way it looks against the snow... well, so far those pluses have outweighed the negative of it being a moisture-sensitive plant. 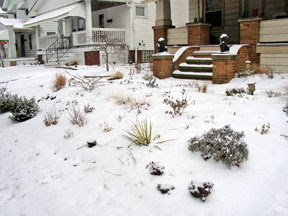 The snow also reveals what a distressingly messy gardener I can be. I'm not terribly apologetic about this, to be honest, because I love seeing seedheads and frost-frazzled leaves from plants like yarrow, echinacea, and of course all of the grasses as well. 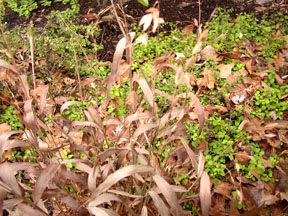 I may regret my decision not to clean up a few prolific self-seeders, like bronze fennel, atriplex hortensis, 'Hopi Red Dye' amaranth, and these Northern Sea Oats... but I figure that doing a spring cleanup, and weeding out or transplanting a bunch of seedlings, will give me some "light duty" projects to do in a few months, when I'm itching to really dig in the dirt but know that I shouldn't! 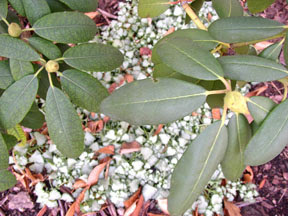 Last but not least, when the snow has provided a ground of white for your plants, and flashy annual color is a distant memory, you can sometimes better assess your overall design where perennials and shrubs are concerned. I've always struggled a bit with identifying my own garden design style, but it's probably technically identified as "eclectic." That said, I like the way that Craig at Ellis Hollow described it to me not too long ago: controlled wildness. Right now, this garden seems to have a little too much "wildness," and not quite enough of it is "controlled!" A couple of the more formal elements that I had introduced, like planting the Japanese hollies in a row, and echoing that with a row of 'Hameln' pennisetum in the middle of the garden (above the golden yucca) really stand out now as places for your eye to rest. I think that providing another formal but modern element, and providing the eye another place to rest, answers my question of what to do in the 18-inch strip in the foreground of this picture, in front of the yucca, caryopteris, and euphorbia. In fact, I think that what I need is to have a straight line of shorter grasses there. Much as I have been enamored of my carex buchanii (left) of late, I think that something unfussy, in a medium green would be best. Something that is not usually used in a formal way. Maybe some prairie dropseed--which I've been trying to find a place for in my garden anyway--or maybe the 'Hameln,' but more of it, with the prairie dropseed planted in its current place instead. Whatever the actual plant, I think that making this tweak will help tame this area and give it a little structure. Unless, of course, further viewing of the snowy pictures reveals another idea for me! Well, as Lisa at Greenbow guessed, December's tardy orchid is still blooming for me a month later. 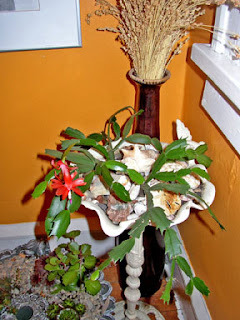 But I got an even better surprise this month: The first bloom ever on my Schlumbergera! About four years ago, while I was in the midst of moving into this house, some older friends of mine at work retired. When they packed up their office, they gave me their huge spider plant as well as cuttings from their Christmas cactus--which itself was a passalong from Julie's great aunt. One of my volleyball teammates gave me the beautiful cast iron birdbath, which I quickly determined was too pretty for the birds, as a housewarming gift around the same time. And then I had some shells, and a few unique rocks... and so it goes. See the gray pot on the floor with the scalloped edge? That's another birdbath, one that I discovered is not frostproof despite its claims to the contrary. So some funky sedums, colorful hens & chicks, and a few other succulents were added this fall, and I think I might add some string of pearls plants to the broken edge this spring as well. I can't wait to bring it outside. 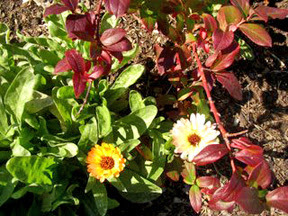 Sometimes I think that I should have called my blog "The Repurposed Garden," considering all of things I have pressed into service over the years, in roles that they were never meant to play. But I like to think that they are all a bit happier this way... that it's better for a sculptural birdbath to be reused as a planter than chipped into a bed of rock mulch. That it seems more fitting that the sturdy pine bedframes I trashpicked a couple of days ago will stand proudly as trellising, rather than being reduced to splinters in a trash compactor. I believe that there is an inherent beauty in usefulness. Sometimes I think that's what winter is all about--a time when the obvious beauty is stripped away and we are mostly left with other things to admire: utility... history... and the friendship behind a very pretty passalong plant or two. Last week, we were dealt high temps in the 20s and blustery winds that cut right through all but the sturdiest of winter clothes. I am nothing of a clotheshorse, but I am not afraid to shell out money for good, sturdy, long-lasting clothes... and so I have a nice Burton "Toast" snowboarding jacket with a removable down liner, a cute but functional knitted wool cap, and a pair of khaki-colored snowboard pants that work just as well for walking the dog as they do for hitting the slopes. I needed none of that today, however, as it was a balmy 65 degrees! I've been working 80 hours a week for the past three weeks (with just Christmas Day off) and so I took a much-needed "recovery day" today. Bri, Coco and I went for a long walk in the Metroparks in just jeans and light sweatshirts... and then I took a walk around the garden to see what caught my eye, like these little variegated iris next to a dark heuchera. A few things caught my eye in a not-so-good way, too. I took some divisions of my Mom's lamium last spring and summer, and they have spread nicely underneath the rhododendron, highlighting the rhodie leaves in a very good way. Look closer at the cluster of rhodie leaves on the left, however, and you'll see the ugly evidence of chlorosis. I am not one for babying plants much, but this rhodie is obviously old and I really like the way it looks against the house. 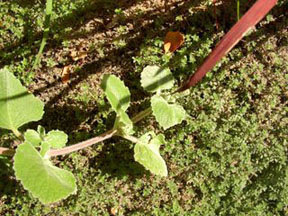 (Evn though it was planted too close to the house in the first place.) So I may have to take some corrective action in the spring. 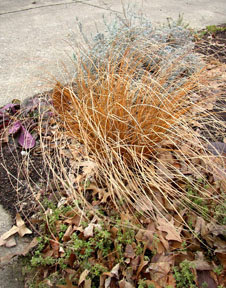 ...but this carex buchanii, with its warm reddish bronze tones, is my current garden favorite. 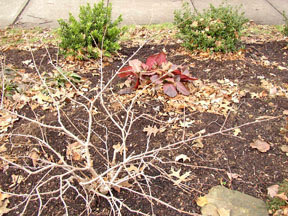 It seems to get a little more lax in the winter, and here you see it sprawled across a variegated lemon thyme. 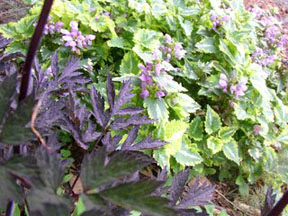 It contrasts nicely with the silvery-blue lavender foliage behind it, and is warmed up by the young clump of 'Purple Knockout' salvia lyrata at the corner of the bed. Hellebores can be counted on to show some green in the wintertime, but I especially love seeing their fresh foliage--some of which is edged in red--as in the first picture on this post. With little else showing any signs of growth, it makes me admire the toughness of the hellebores even more. On first sight, I was a little worried about this hellebore, which I transplanted twice in the middle of our summer drought. Yes, I know what all the experts say about transplanting hellebores, much less during a drought. But I've moved my hellebores multiple times with no ill effects so I figured I would take just one more chance. 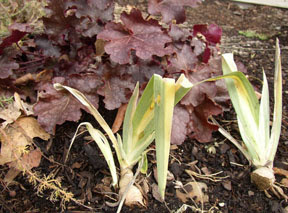 Luckily, there are little green buds hiding beneath the mulch of beech leaves at the crown of the plant... I covered them back up and tucked them in after taking this picture. 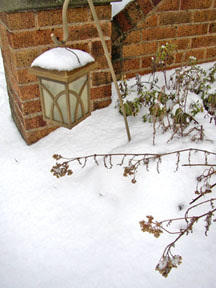 Last, but not least, this photo shows part of what I see when I walk down my front steps each morning. The architectural shrub in the foreground is a doublefile viburnum that might be on its way out... frankly, this shrub needs more moisture than my well-drained soil and this low-maintenance gardener is willing to give it. (If my parents are willing to give me the space at their house, it would be much happier there.) I won't pull it until I can decide what to plant in its place, however. Side note: This blog is a true "labor of love" for me, and while I'm not trying to make any money from it (hence the lack of Google ads, etc.) I am trying to keep it from costing me money. I'm already using 25% of my usable picture storage with Google, so I'll be resizing photos from older posts through the next few weeks and reposting them in an effort to "buy" a bit more storage space for the coming year. I share this only because I understand that some people use feeds to keep up with various blogs... and I have no idea whether people subscribe to my feed or not but I don't want to bombard anyone with notifications of my reposts. So I will be disabling my feeds while I'm doing all of this picture resizing work, and will enable them again after the work is completed.